A fantastic night was had by all. The Kent Invicta chamber put on a great event at Canterbury Cathedral lodge. 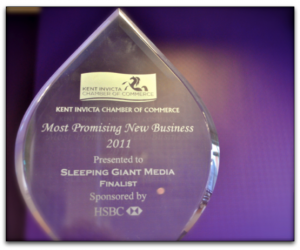 Sleeping Giant Media ended up winning the finalist award for the most promising new business in Kent. Sadly not the top prize for this category, but still a fantastic achievement for everyone involved with the business. As long as things continue in the same vein we hope to tip the scales in our favour for next years awards. Hopefully this is the first of many awards that we will be involved with. We would like to thank everyone who has been involved with the business. Friends and family who have offered their time and support to help us reach this point.